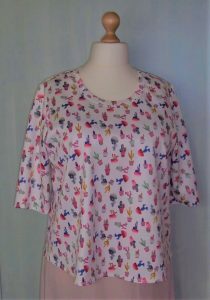 Yet another Deer & Doe Plantain Tunic! 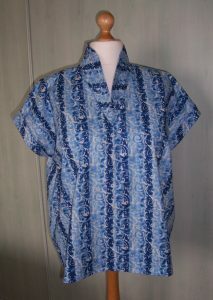 Yes, here is yet another Plantain tunic top! 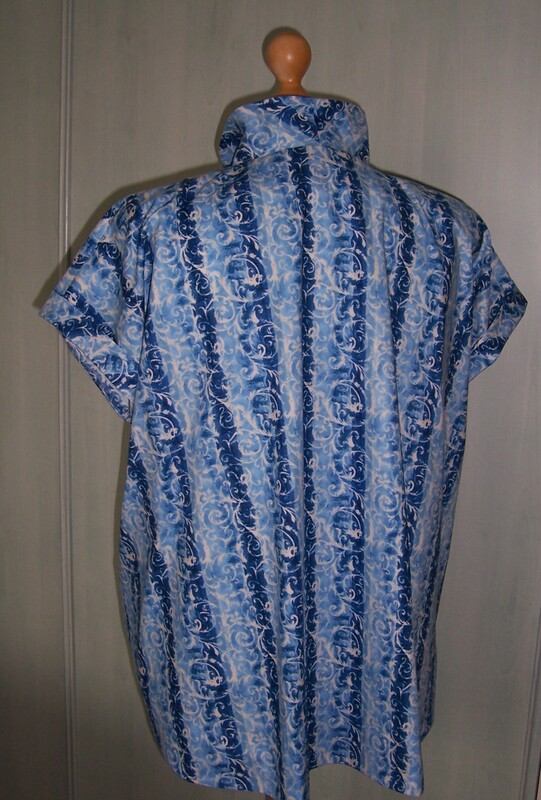 For the first time I have used a heavyweight Scuba fabric to make up this garment. 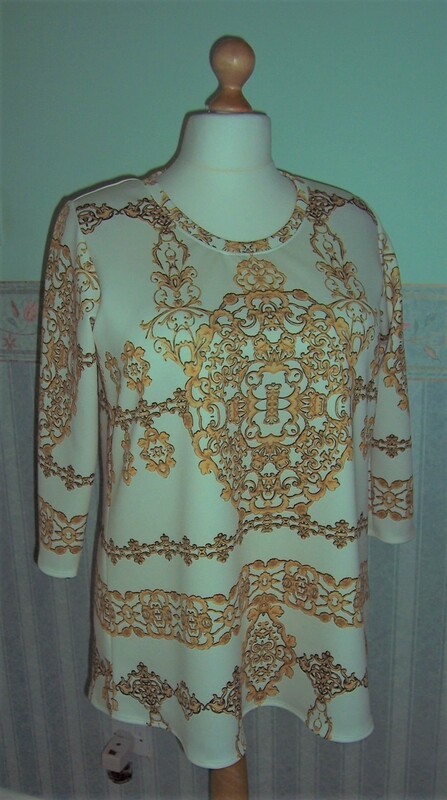 I purchased Large Scale Print Scuba Stretch Jersey Knit Dress Fabric Cream & Gold (polyester and elastane) at just £4.99 per metre from Minerva Crafts. I bought 3 metres in April 2018 and now there are just a few scraps left. 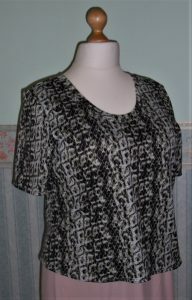 The Plantain tunic did not use all the fabric, I also cut out a Paolina top for a friend to practice using an overlocker for garment construction. 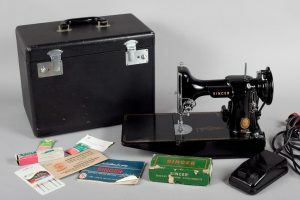 Lizzie took just about two hours to complete the construction and I think is now all set to buy her very own Overlocker. That will be when she has finished buying and playing with Singer Featherweight machines! Let’s not go down that particular rabbit hole today ….back to my Plantain. At first I thought the completed tunic would coordinate with my White trousers but in hindsight it does look a little ‘off’. 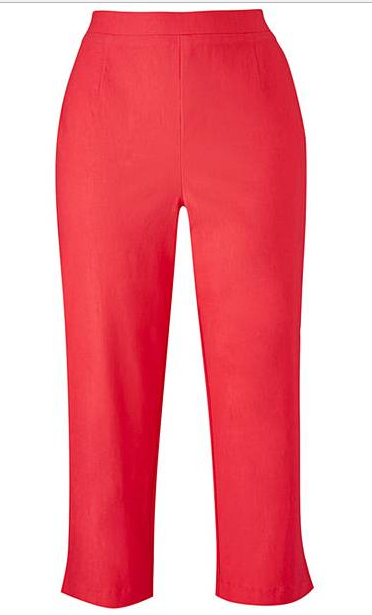 However, it will go well with an alternative pair of Capri pants in a rich Watermelon colour. As I have now made up this pattern several times it can safely be referred to as a TNT. 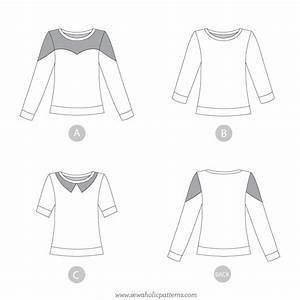 My usual alterations applied :– raised the centre front neckline by 2 inches and reduced the sleeve length by 4 inches. I added approximately 4 inches to the length of the body whilst taking into account the placement of the design. I have managed to centre up the main features of the design on the neckband, front, back and sleeves of which I am very proud. 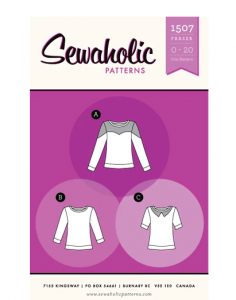 The hems of the sleeve and the bodice are stitched with a twin-needle. This particular Scuba has a very silky finish and is easy to wear, although possibly a little too warm for our current ‘heatwave’. Those of you who are regular readers of my blog will know that I do not enjoy alterations. As far as I am concerned, Re-fashioning also comes under that banner. 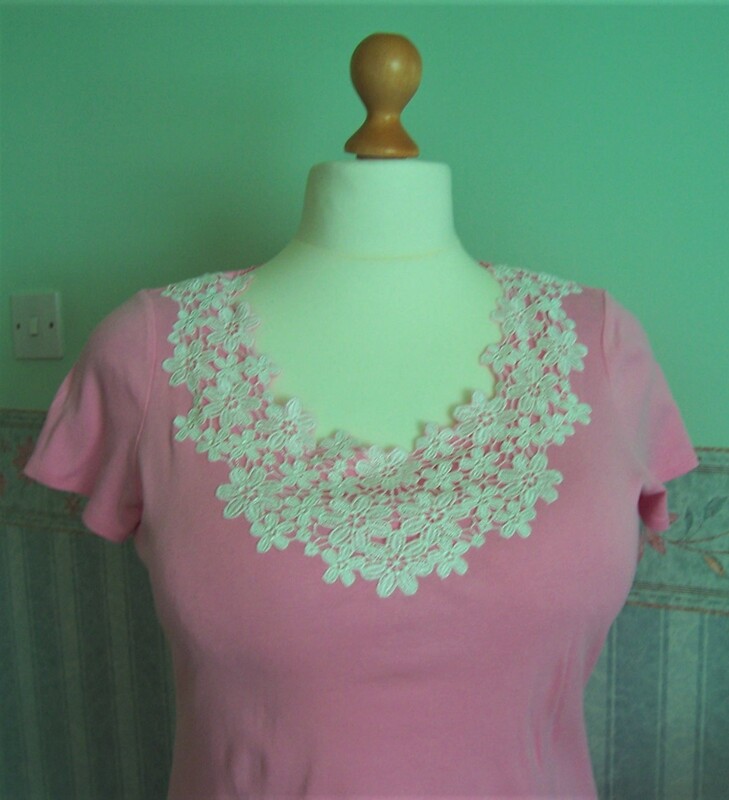 However, in a moment of weakness I fell for and purchased several guipure lace appliques from eBay with a view to using them when making new tops, tunics and dresses. 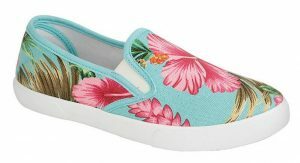 The stitching took some time to complete. I was glad to be using the knee lift on my machine as it left both hands free at all times to manipulate the fabric and trim whilst I stitched. 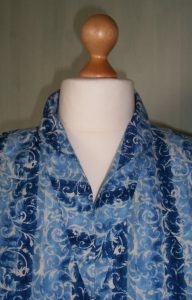 The original neckband was removed along with the excess fabric from the outer edge of the trim. This left a stretched back neckline. What to do? I turned under a scant ¼ inch and stitched in place. Still baggy. I threaded a hand sewing needle with double thread and ran a neat row of gathering stitches along the back edge and drew up the neckline to a neater finish. I am pleased with the result and just hope that my hand stitching is robust enough to control the fullness of the back neckline. 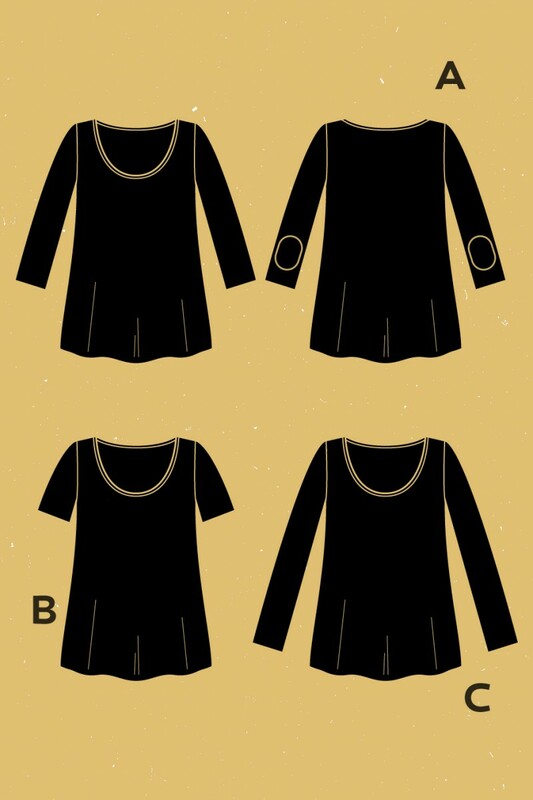 Final analysis: If I use any of the other appliques on new dressmaking projects I will have to devise a method for neat finishing of the back necklines. 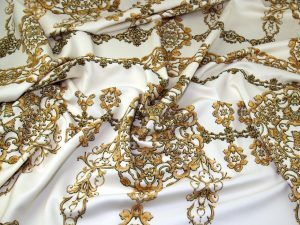 Other than that the use of these trims certainly adds a beautiful decorative finish to plain garments. 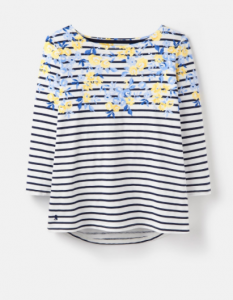 As I said in a previous post, I particularly liked the contrast print versions of tops displayed in the Joules store on board ship. The Fraser Sweatshirt top by Sewaholic patterns is new for me, bought especially for the contrast section of yoke and sleeve tops so that I could make my own version of a Joules top. 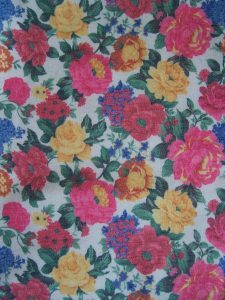 I had already purchased some White with Navy stripe Ponte Roma from an eBay seller – 2 metres for £16.48 plus some pretty floral print Ponte Roma from CheapestFabricsUK another eBay seller, 1 metre for £5.95. So total cost £22.43 which does not compare very favourably with the cost of a ready-made. However, with my fabrics I shall be able to make at least two tops so that brings the cost down by half. 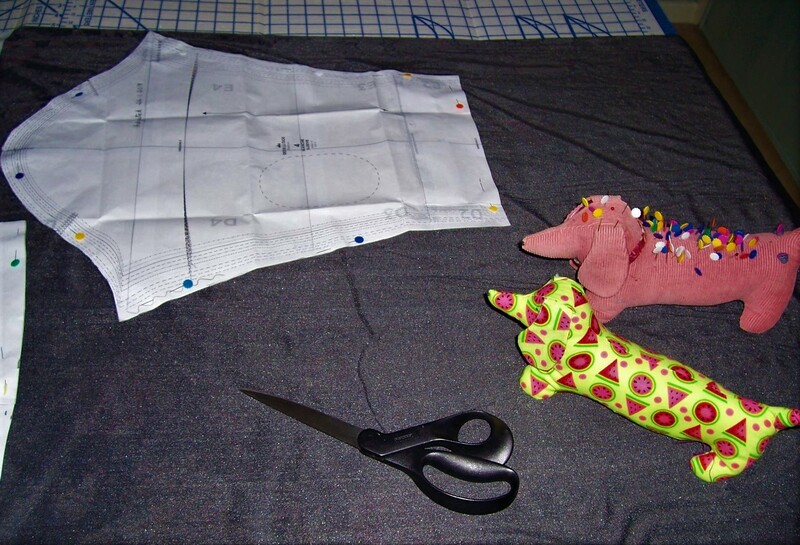 I compared the pattern measurements and finished sizes to my own personal dimensions and cut the size 20 plus an additional ½ inch at side seams. I reduced the sleeve length by 4 inches (I must have extremely short arms!) to give a 7/8th sleeve length. I lengthened the body of the garment by 3 inches as I did not intend to add the hem band. Cutting tops longer is always a good idea – they can be always be shortened if necessary. Construction was fairly straightforward though it would have been easier if I had not had stripes that needed matching. I think I have achieved a fair result. 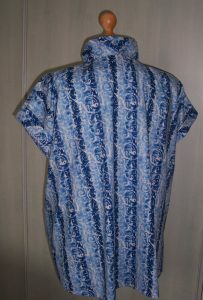 For continuity, I drafted a back yoke to be cut from the contrast print in addition to the front and sleeve contrasts. At fitting I discovered that the side seams needed to be taken in by a good 2 inches at each side grading out to the original stitching at the hips and hemline. The sleeves were cut as size 20 at the cap and underarm, grading out to a size 12 at the hem. I took in about 1 inch from the sleeve seams. The sleeve and body lengths were fine. 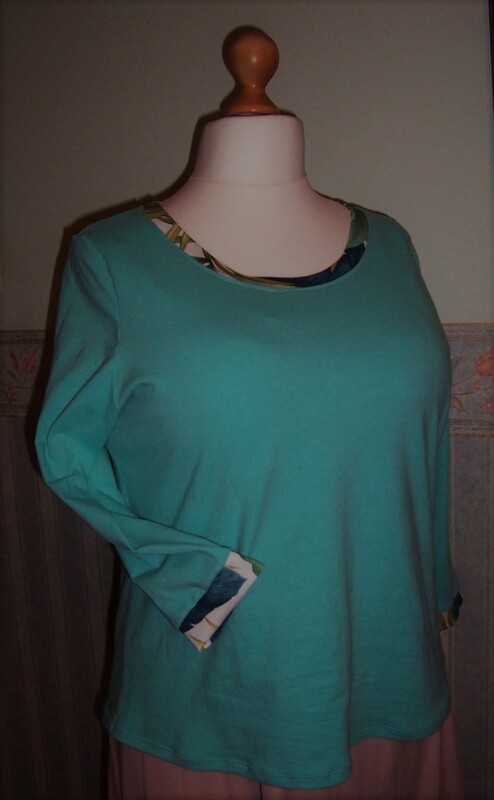 The over-sizing is probably due to the fact that this top is drafted as a sweatshirt and is therefore more loose-fitting than usual, I should have taken more notice of the amount of ease allowed on the pattern, plus the amount of stretch in my fabric. The neckband was troublesome. 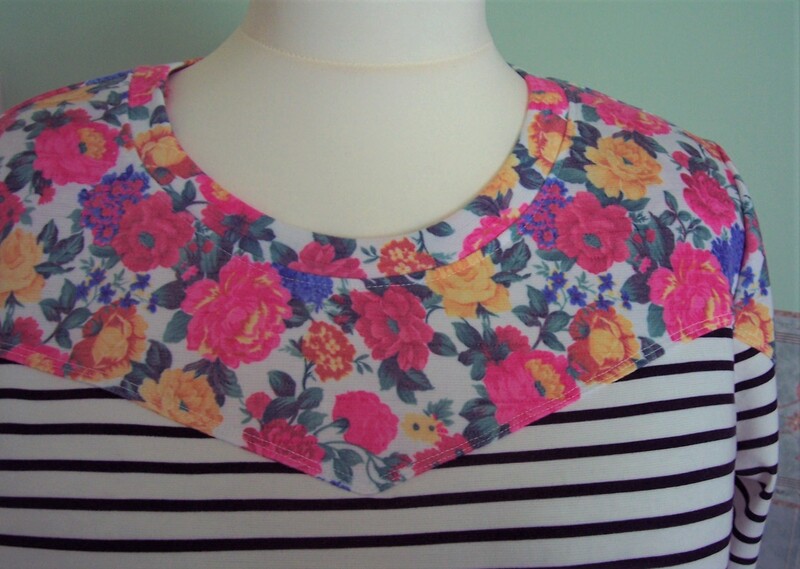 Initially I cut the length according to the pattern piece but this was too long and resulted in a baggy neckband. I cut it off and re-did the neckband. 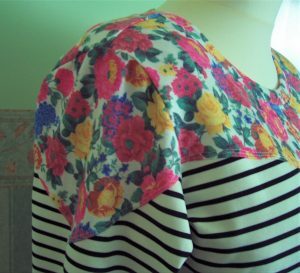 This time I managed to get two little tucks in the garment – right on the front – so again the neckband was removed. Third time lucky! The neckline is now somewhat lower than the original but in fact I prefer this so have adjusted the pattern accordingly. 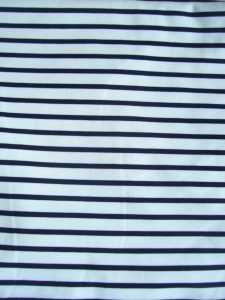 Hems on the sleeves and body were stitched with a twin needle. As I was on a roll, I then top stitched, again with the twin needle, all along the joining seam of the contrast panels, yokes and shoulder caps. I am very pleased with the resultant garment and will definitely make more tops in this style. Perhaps next time I will make a high low hem as in the Joules top. Not only will I be using these two fabrics but also I will be digging into my stash bucket for remnants. 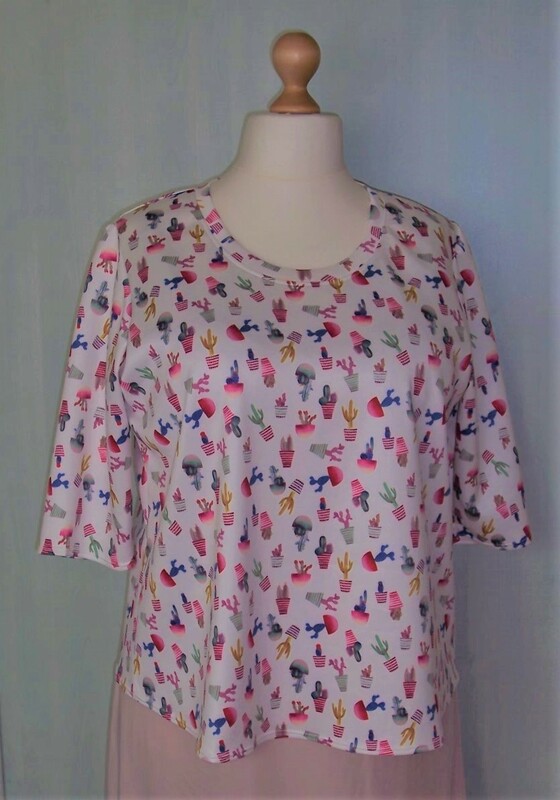 Hot on the heels of the success of the 2nd version of The Lady Skater dress I ran up this great tee-style top using the extended bodice pattern with short sleeves. Nothing more to say other than this may be my new favourite! 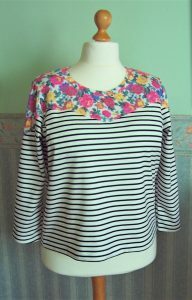 In the past few months I have made a couple of Paola tops which for one reason or another have not turned out as I would like. Usually when this happens I offer the garment for sale on eBay and if not sold it is put aside to go to the local charity shop. In this instance I really wanted to keep the two Paola tops for myself, so something would have to be done. 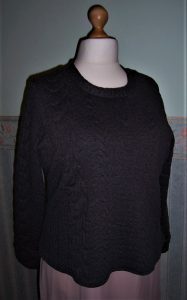 The first – a Grey Sweater Knit style Ponte from The Textile Centre finished up quite fitted with a polo (turtle) neck that was uncomfortable as it was so restrictive and close to my neck. Also the sleeves, once I had added long cuffs, made them too long. Even though I had intended for them to cover my wrists in the really cold weather, I found them uncomfortable and was forever folding them back. The second, an Aqua-coloured Paola was made using a cotton jersey bought when on sale from Charlee Girl. The entire garment felt too big, the neckline was stretched, the sleeves too long and the hemline with the twin-needle stitching was very wavy. 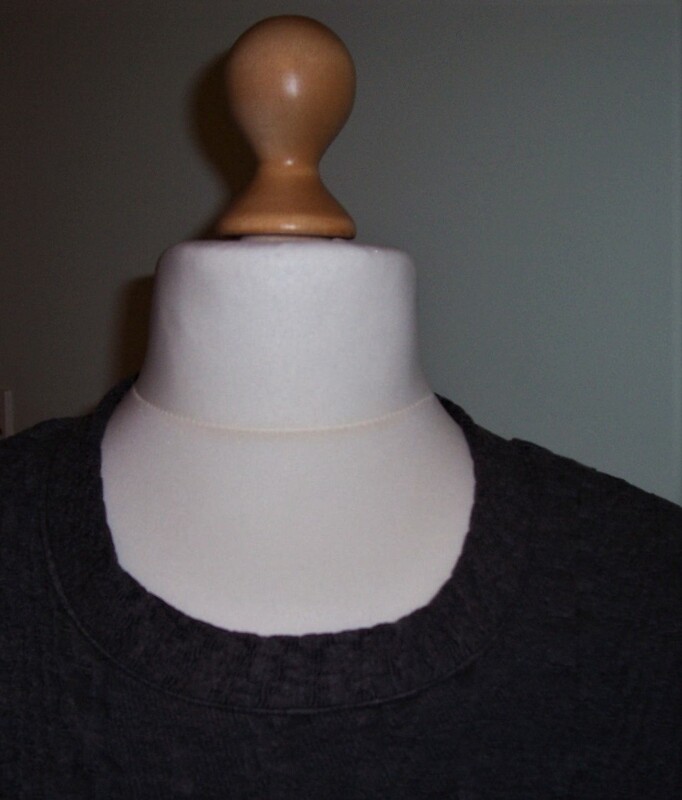 For the Grey version I first cut off the collar and re-shaped the neckline to a low crew shape. Using some remnant of fabric I cut a neckband 2¼ inches wide and following my TNT method, applied this to the new shape. The sleeves were also an easy fix. I cut off the cuffs and removed the overlock seam. I removed 3 inches from the length of the sleeves before re-attaching the cuffs. Now they are exactly the right length. Whilst I had the Charcoal Grey thread on the sewing machine I took the time to take in the side seams at the hemline by approximately 1 inch each side, grading to 0 inches at the waistline. 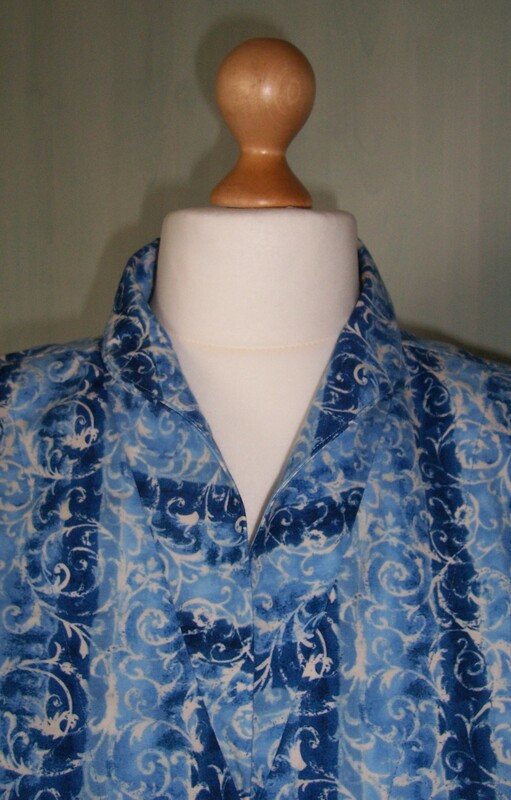 Again for the Aqua Paola I removed the collar and re-shaped the neckline. This time into a wider, more scooped line. I used a remnant from the tropical leaf print jersey dress that I made last Summer to cut a neckband. 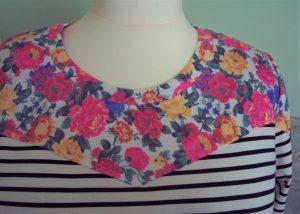 Once again, my TNT method resulted in a great-looking neckband complete with co-ordinating top stitching. The sleeves were each reduced by approximately 3 inches before adding a cuff, also in the contrasting tropical leaf print jersey fabric. 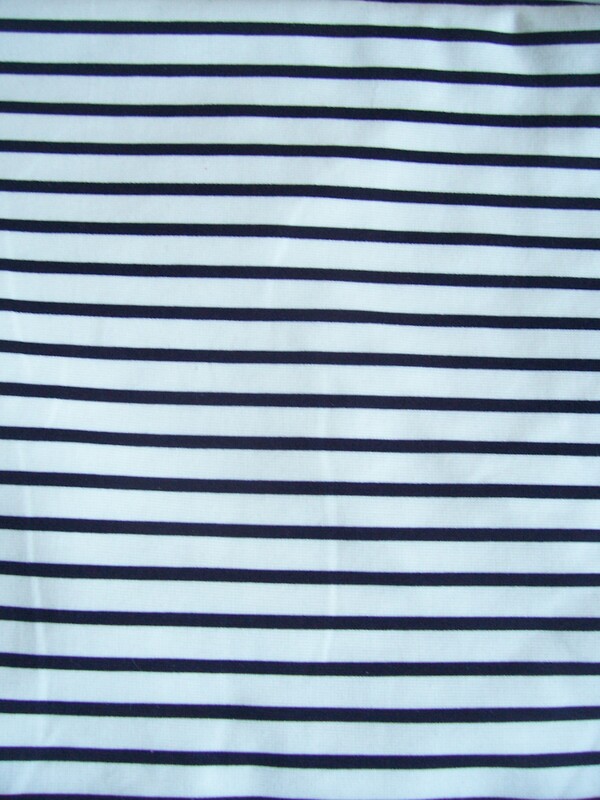 The wavy hem was given a thorough press and it is now ‘behaving’ itself. I have retrieved possible ‘rejects’ and now there are two new tops in my wardrobe. 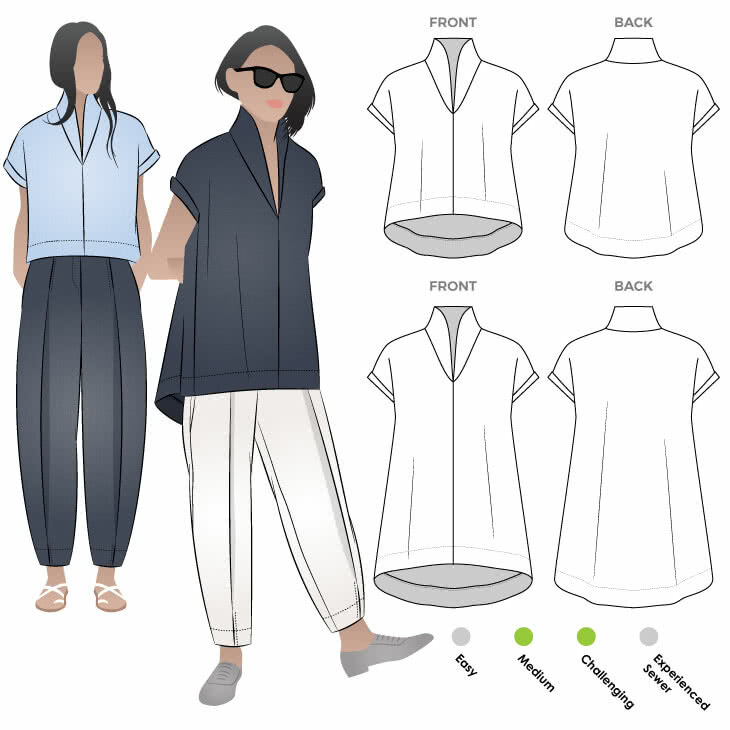 This exercise has also taught me how quick and simple it is to re-shape a neckline, apply a neckband and add contrasting cuffs to a tee top. 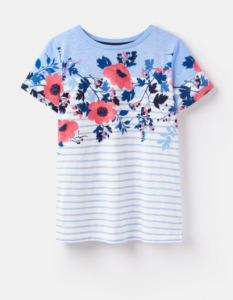 As good quality tees are readily available from High Street stores at very competitive prices, in future I might buy some and refashion to make new ‘originals’. 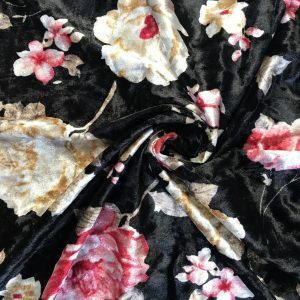 I bought this fab-u-lous stretch velvet from Stitchy Bee sometime at the end of last year and since then it has been in my ’roundtuit’ pile awaiting just the right pattern to make it up. I have now well and truly tested the Plantain tunic top by Deer and Doe which is fast becoming one of my favourite TNT patterns. I ensured that the pile of the velvet was running down the length of the pattern and quickly laid out the pattern pieces. The fabric was a delight to use. 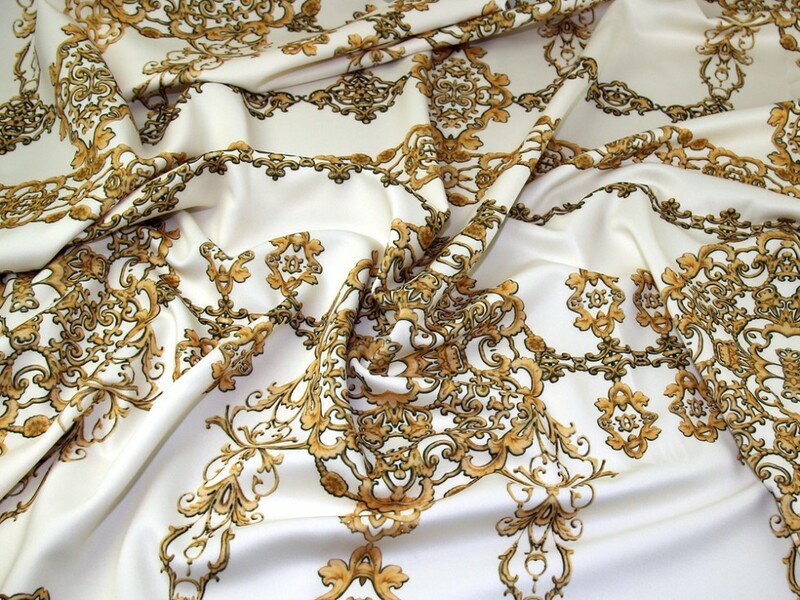 The wrong side is soft and silky and the surface feels just like real silk velvet. 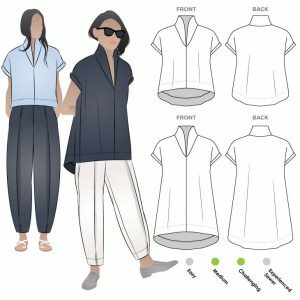 I made my usual adjustments – raised the centre front neckline by 2 inches, lengthened the tunic by 4 inches and shortened the sleeves by 4 inches. 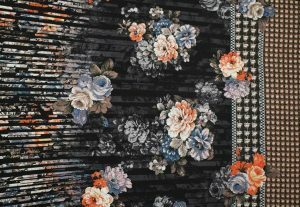 The pattern took just 1.5 metres of fabric and as had I purchased 2 metres at £9.90/metre I now have sufficient remaining to make a lovely evening bag – but that will be for another day as I already have a super beaded evening bag to use. 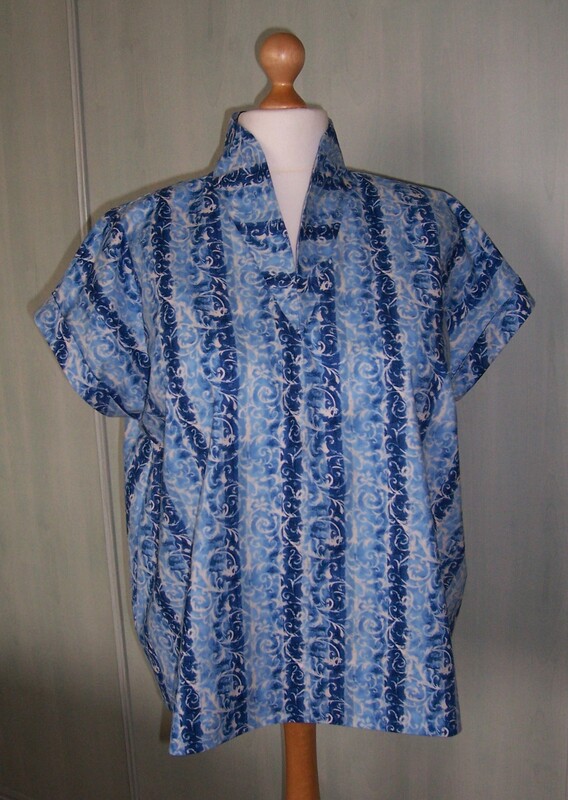 Apart from the neckband, the entire tunic was stitched on my sewing machine. For the main seams I used the ‘lightning’ stitch length 3.5 and for the hems a standard straight stitch – also at length 3.5. I believe that I have now completed the dark-coloured garments in anticipation of the cruise – although I do have some lovely dragonfly printed cotton ready laundered…. hmm …. no better get on with the circle skirt in Ivory Ponte. At the end of making the Dartmouth Dress hack using this charming printed Ponte from The Textile Centre I had approximately 70 cms left over. What to do with it? In my stash I had recently discovered some remnants of plain Ponte in various shades of Teal, Red and Black. There was just sufficient of the Black colourway to make sleeves and I would use the printed Ponte for the body of a Tunic. 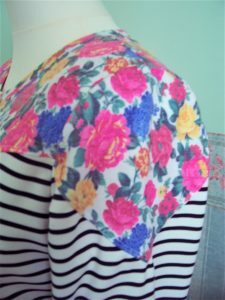 Originally I had thought I would trial yet another raglan sleeve top but decided against that as I really wanted to be assured of a successful outcome for this final piece of Floral/Shutter border print. 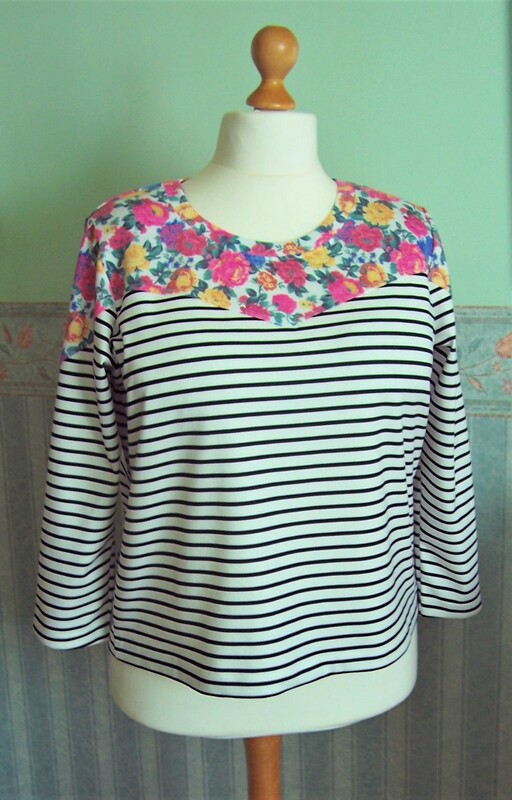 So yet another version of the Plantain Top by Deer and Doe it was to be. I laid out the bodice front and back and cut them as long as possible from the printed ponte, followed by the sleeves and neckband from the plain Black ponte. 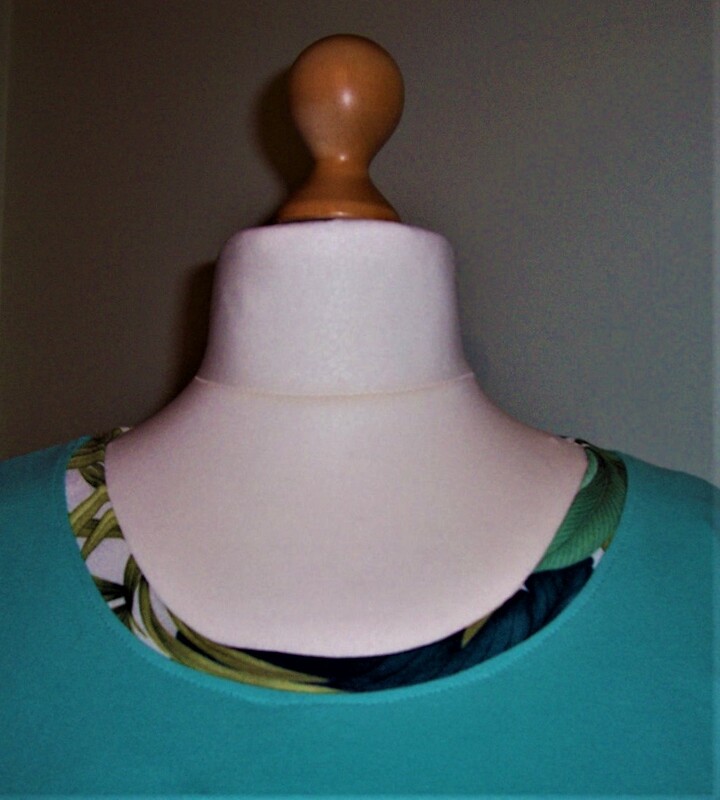 The only adjustment made to the pattern was to raise the centre front of the neckline by 1¾ inches as previous versions had finished up dangerously low! Construction was plain-sailing. I have left vents at the side seams and the final version has a high/low hem with the front being slightly longer (to accommodate my bust). The completed garment looks great worn with Black skinny jeans or leggings. 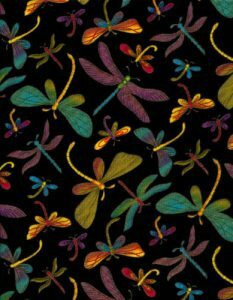 In the previous post I mentioned that I had some small sequinned jersey fabric bought from Fabricland at just £1.79/m I cannot praise this fabric highly enough. It sewed like a dream! Hot on the success of the Aubergine jersey trousers * made from Simplicity 2289, I have now completed the ensemble with a co-ordinating tunic top. The previous endeavour with the Plantain top by Deer & Doe was not a great success but I could see that there was great potential and having made a few adjustments to the pattern I set about making my second Plantain. 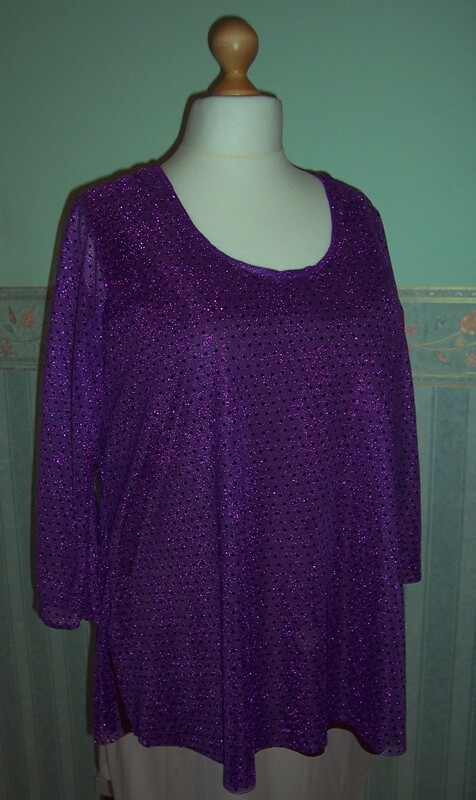 To begin with a cut a bodice front and back from the Aubergine jersey as I could see that the sequinned fabric was too fine to be worn without something underneath. I cut the pieces with a 4 inch extension to the length. 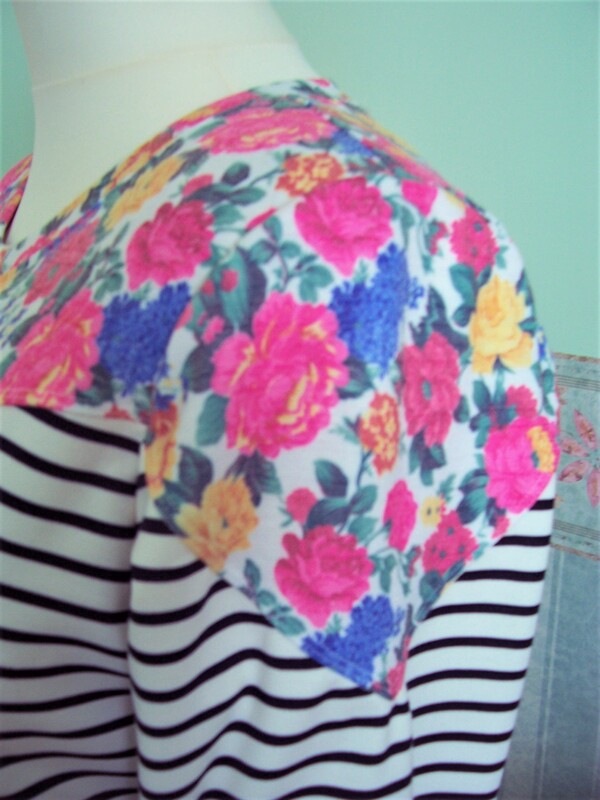 Having stabilised the shoulders, I stitched with the overlocker and then top-stitched with the twin needle. 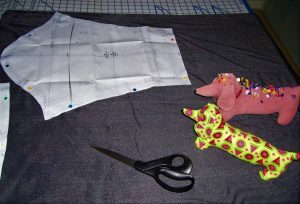 I then sewed up the side seams leaving an 8inch opening each side for the hem vents. I tried on this ‘lining’ to check fit and it was ‘just right’. Now onto the sequinned jersey. Having learned from the previous sequinned fabric, although there was a lot more stretch in this particular fabric, I cut a little extra width on the bodice front, back and sleeves. Next step was pinning the lining at the neck edge and armholes. I had put the tunic onto Dolores the mannequin and it made this task much easier. The two bodices were then basted together. For the neckline binding I repeated the trick of using the non-sequinned selvedge area cut 2 inches wide x the length required for the neckline. The binding was folded in half and stitched to the inside of the neckline before folding over the raw edge and top-stitched in place. A very neat finish. 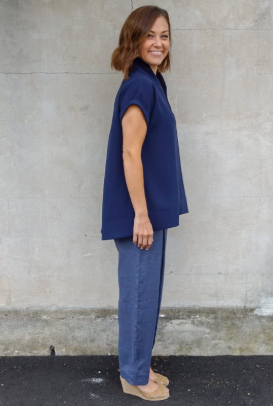 The sleeves have a narrow single-turned hem stitched with the twin needle but I have left the hems on the lining and tunic front and backs as raw edges. 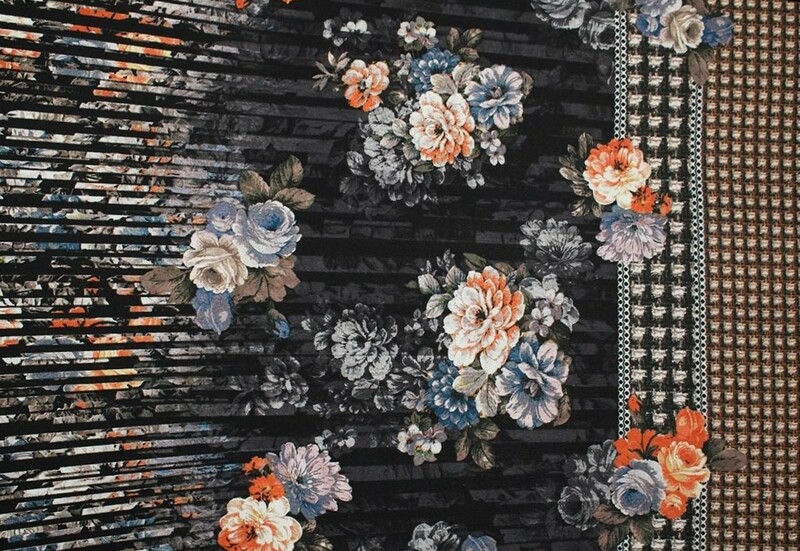 The length of the lining has been trimmed to approximately ½ inch shorter than the sequinned overlay. 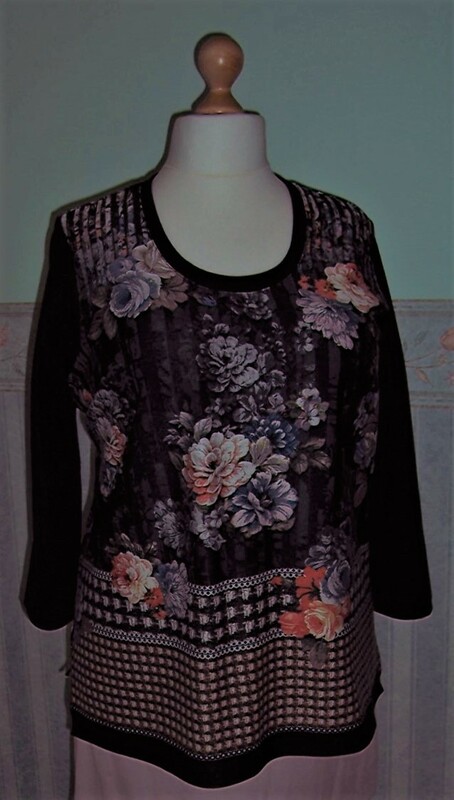 I am absolutely delighted with how this top has turned out – I originally purchased 3 metres and there is about 20 cms left. 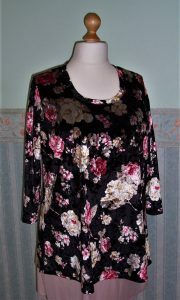 So a beautiful evening tunic for less than £10.00! 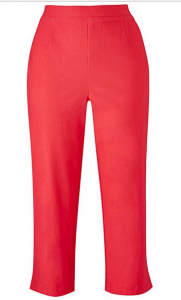 * In my previous post I stated that the jersey for the trousers and lining of this top came from Minerva Crafts. Unfortunately this is incorrect. The fabric came with a massive haul bought online from Fabricland. As far as I can tell it is no longer offered on their website but I am pretty sure it was the same as that offered by Minerva Crafts and detailed in the previous post.